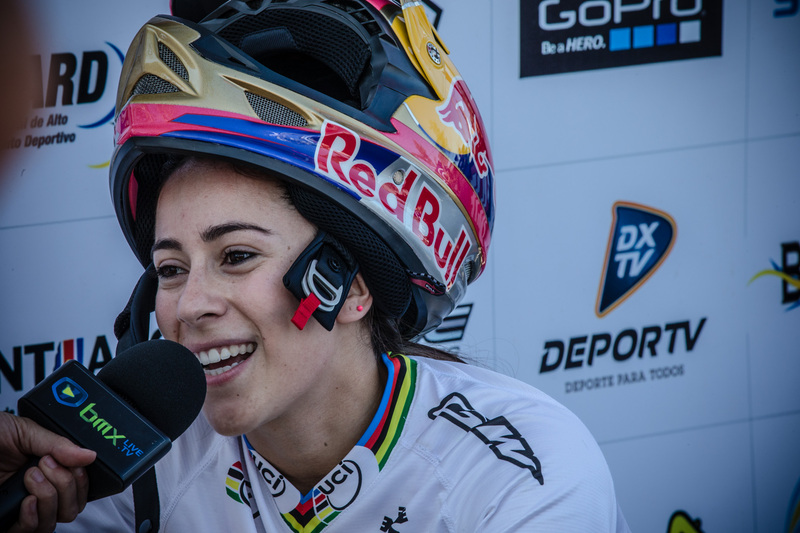 Pajon wins women final at UCI BMX Supercross World Cup round four. Sunday 7 September 2014. (Santiago del Estero, Argentina). 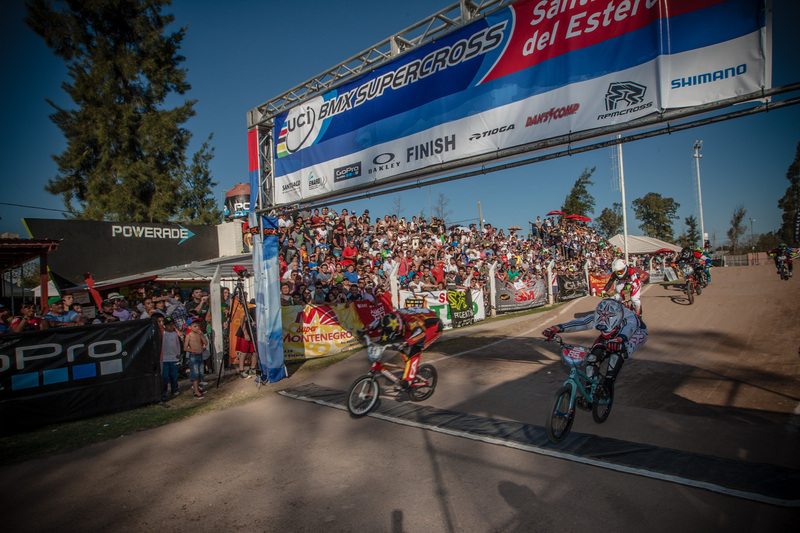 BMX Supercross racing was nothing short of spectacular in Santiago Del Estero when the qualified riders got to line up on the gate at round four of the UCI BMX Supercross World Cup series. Two time Olympic gold medalist Maris Strombergs (LAT) edged out series leader Liam Phillips (GBR) at the finish line by only a few inches for the win. Under perfect weather conditions and in front of a sold out crowd, Mariana Pajon (COL) crossed the finish line in first in the women final and moved up to 5th place in the standings. 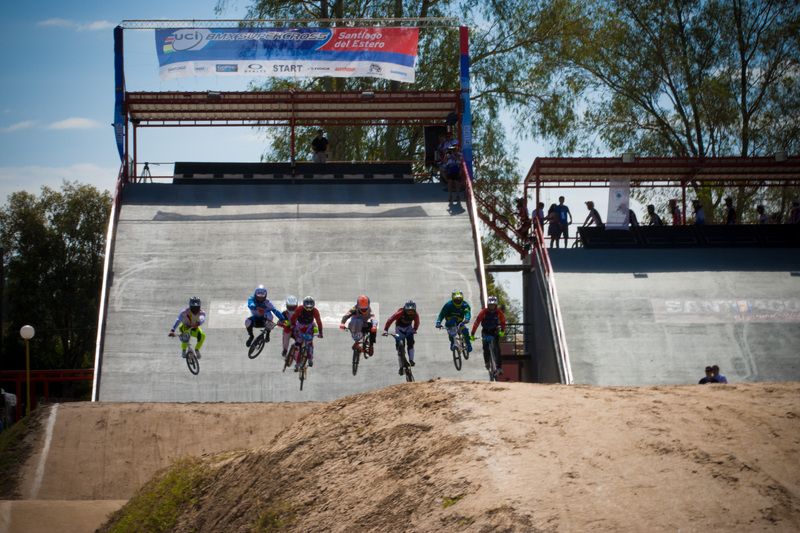 A few modifications had been made to the track in Argentina since the UCI BMX Supercross World Cup series was in town last year. The first jump got a little bigger and in general the track was smooth, had a long and wide first straight and the turns were big. Passing was a possibility anywhere on the track and that’s what the crowd got to see. Liam Phillips (GBR) and Tory Nyhaug (CAN) took care of some excitement in their first moto when Tory’s rear wheel slipped in the first turn and Liam could not avoid him and went down as well. Both high ranked riders scored well enough in the remaining two qualifying heats to move on to the quarter finals, and later the final race of the day. Unfortunately for the home crowd Gonzalo Molina (ARG), Lucas Bustos (ARG) and favourite Frederico Villegas (ARG) did not make it out of their quarter finals. But in their defense, the level in the Men class is incredibly high and both semi finals could have been a final at any race. Making it through were Connor Fields (USA) who was looking strong all day, Liam Phillips, Renato Rezende (BRA), Anthony Dean (AUS) who was aiming to get closer to Liam Phillips in the overall standings, Maris Strombergs (LAT) who had just won the last UCI SX World Cup round in Berlin, Tory Nyhaug, Van Gorkom (NED) and the ever consistent David Herman (USA). The crowd got on their feet when the Pro-Gate dropped at the green light. On the inside Maris Strombergs wasn’t going to back down with Liam Phillips and Tory Nyhaug getting on his right hand side. In the first left hand 180 degree turn the Latvian made sure his elbow was in front of Liam’s but that wasn’t the end of it. In the second turn you could have thrown a blanket over the top six riders as everyone was looking for an opening to stick their front wheel in. Strombergs was leading the race but felt that Phillips was on his tail. The Brit railed the last turn and started sprinting towards the finish line trying to pass the Olympic champ. A photo finish was needed to see who won. Maris Strombergs got first place, Phillips finished a close second and Tory Nyhaug grabbed third place. Series leader Caroline Buchanan (AUS) had one thing in mind in Argentina and that was to stay consistent. Her lead in the series coming into round four was substantial but wrapping up the title in Santiago del Estero was not happening for the Aussie. Alise Post (USA) and Mariana Pajon were looking the fastest on the track all day and they were the ones battling it out in the final. Melinda McLeod (AUS) had an incredible first straight in the final but she had to come from the outside. Post had the inside lane but cased a jump which shot Pajon to the lead. Post then passed McLeod with a classic high low in turn number two but by that time the Colombian rider was gone and crossed the finish line in first. Post followed in second and third went to McLeod. Series leader Buchanan finished 7th. 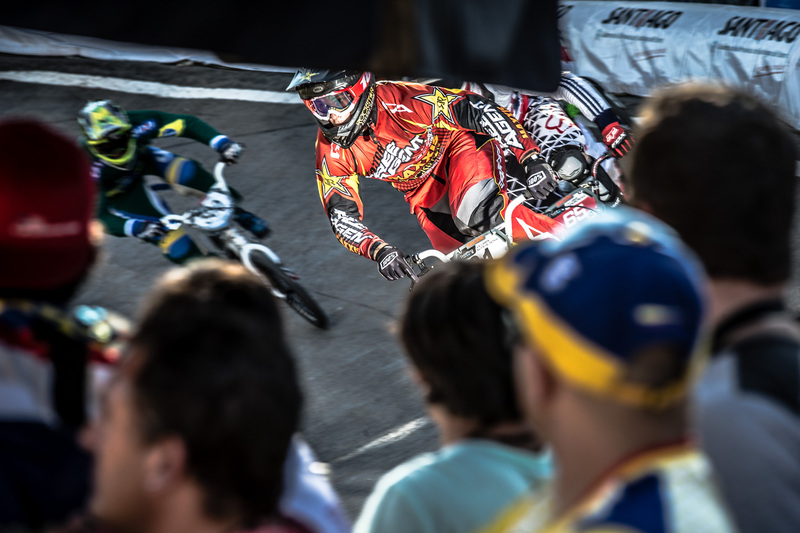 Liam Phillips and Caroline Buchanan remain the leaders going into the last round of the UCI BMX Supercross World Cup series to be held at Chula Vista, USA on 26-27 September 2014.